I used rankcrew before and it worked well. Recently I added more funds and placed some bookmark orders. But the orders keep queued for 7 days. 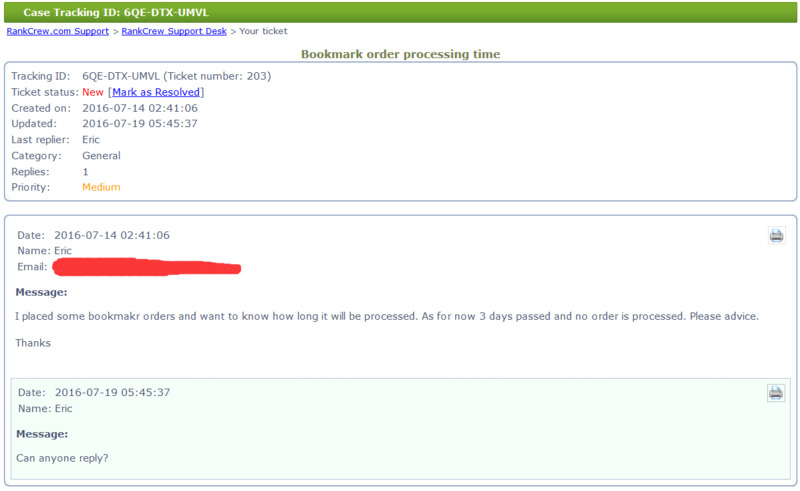 I send a support ticket sevseral days ago and no reply received till now. I want to post it in the rankcrew section but I can't find it now. SO I want to know what's wrong with rankcrew? Is it still in service? Re: What's wrong with rankcrew? Jon no longer owns RankCrew, it has been taken over by someone else. Their helpdesk would be the one to contact. I felt being cheated. I don't know jon announce this news formally or not, but I didn't know it. I use it only as it owned by jon and I trust jon. I have sent a ticket On July 14, till now I don't get any reply. I still have balance in my account when jon owned it and I also added more recently. What I want to know is how can i get the all funds back if rankcrew doesn't take the works they should finish? Please help! I have sent a ticket On July 14, till now I don't get any reply. I still have balance in my account when jon owned it and I also added more recently. What I want to know is how can i get the all funds back if rankcrew doesn't take the works th uey should finish? Please help! Support returned the money I had in Rankcrew. Others had their money returned too. I am a user here, not support, so I cannot deal with tickets. I see that the ticket you have shown above appears to be from the rankcrew team - that would presumably be the NEW owners of rankcrew. The support I was talking about is Jon Leger's support desk. https://askjonleger.desk.com/ That is where you would need to submit a ticket. I just sent a ticket to Jon at jon's support desk. See what will happen. I will let you know if any news. Thanks again for your help?